USB 3.0 is the second major revision of the Universal Serial Bus (USB) standard for computer connectivity. The standard from 2008 implements a 5 Gbit/s transfer rate. In the late 1990s, the first major revision was made to the USB 1.1 specification. The revision was called USB 2.0 which added a new transfer speed called Hi-Speed (HS – 480 Mbit/s) to the earlier speeds (Low Speed (LS) – 1.5 Mbit/s and Full Speed (FS) – 12 Mbit/s). The enhancements to Super Speed USB are not just for higher data rates, but for improving the interaction between device and host computer. While the core architectural elements are inherited from before, several changes were made to support the dual bus arrangement, and several more are notable for how users can experience the improvement that USB 3.0 makes over USB 2.0. The good news is that USB 3.0 has been carefully planned from the start to peacefully co-exist with USB 2.0. First of all, while USB 3.0 specifies new physical connections and thus new cables to take advantage of the higher speed capability of the new protocol, the connector itself remains the same rectangular shape with the four USB 2.0 contacts in the exact same location as before. Five new connections to carry receive and transmitted data independently are present on USB 3.0 cables and only come into contact when mated with a proper Super Speed USB connection. 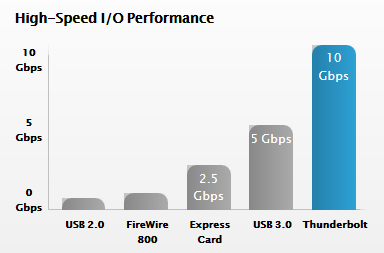 USB 3.0 achieves the much higher performance by way of a number of technical changes. Perhaps the most obvious change is an additional physical bus that is added in parallel with the existing USB 2.0 bus. This means that where USB 2.0 previously had 4 wires (power, ground, and a pair for differential data), USB 3.0 adds 4 more for two pairs of differential signals (receive and transmit) for a combined total of 8 connections in the connectors and cabling. These extra two pairs were necessary to support the Super Speed USB target bandwidth requirements, because the two wire differential signals of USB 2.0 were not enough. Latest OS from Apple and Microsoft starts supporting USB3 with connector. Apple OSX Mountain Lion and Windows 8 comes with USB3 driver support. Ivy Bridge is the codename for Intel’s 22 nm die shrink of the Sandy Bridge microarchitecture based on tri-gate (“3D”) transistors. Ivy Bridge processors will be backwards-compatible with the Sandy Bridge platform, but might require a firmware update (vendor specific). Intel has released new 7-series Panther Point chipsets with integrated USB 3.0 to complement Ivy Bridge. The upcoming Core i-series processors based on the Ivy Bridge architecture are being pitched at ultrabooks, but the company is now extending the chips to high-performance tablets with Microsoft’s upcoming Windows 8 operating system. Apple bringing out a thinner 15-inch MacBook Pro model in the coming months as well as 13-inch MacBooks. Those systems will likely tap Intel’s more power-efficient Ivy Bridge chips..then Hewlett-Packard, Dell, Sony, Toshiba, Acer, and Asus will update and/or bring out new systems. Intel’s Thunderbolt controllers interconnect a PC and other devices, transmitting and receiving packetized traffic for both PCIe and DisplayPort protocols. Thunderbolt technology works on data streams in both directions, at the same time, so users get the benefit of full bandwidth in both directions, over a single cable. With the two independent channels, a full 10 Gbps of bandwidth can be provided for the first device, as well as additional downstream devices. More info Click here. Thunderbolt is a revolutionary I/O technology that supports high-resolution displays and high-performance data devices through a single, compact port. It sets new standards for speed, flexibility, and simplicity. And it makes its debut in the new MacBook Pro. MacBook Pro now gives you access to a world of high-resolution displays and high-speed peripherals with one compact port. That’s because Thunderbolt is based on two fundamental technologies: PCI Express and DisplayPort. PCI Express is the technology that links all the high-performance components in a Mac. And it’s built into Thunderbolt. Which means you can connect external devices like RAID arrays and video capture solutions directly to MacBook Pro — and get PCI Express performance. That’s a first for notebooks. Thunderbolt also provides 10 watts of power to peripherals, so you can tackle workstation-class projects on the go. With PCI Express technology, you can use existing USB and FireWire peripherals — even connect to Gigabit Ethernet and Fibre Channel networks — using simple adapters. And because Thunderbolt is based on DisplayPort technology, the video standard for high-resolution displays, any Mini DisplayPort display plugs right into the Thunderbolt port. To connect a DisplayPort, DVI, HDMI, or VGA display, just use an existing adapter. PERFORMANCE: Thunderbolt I/O technology gives you two channels on the same connector with 10 Gbps of throughput in both directions. That makes it ultrafast, and ultraflexible. You can move data to and from peripherals up to 20 times faster than with USB 2.0 and more than 12 times faster than with FireWire 800. You also have more than enough bandwidth to daisy-chain multiple high-speed devices, without using a hub or switch. For example, you can connect several high-performance external disks, a video capture device, and even a Mini DisplayPort display to a single Thunderbolt chain while maintaining maximum throughput.